The big screen documentary The American Nurse explores some of the biggest issues facing America – aging, war, poverty, prisons – through the work and lives of five nurses. 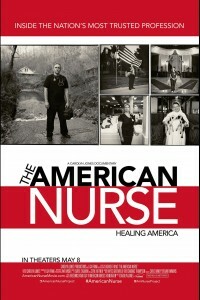 It is a documentary that will change how we think about nurses and how we wrestle with the challenges of healing America. Jason Short drives up a creek to reach a home-bound cancer patient in Appalachia. Tonia Faust runs a prison hospice program where inmates serving life sentences care for their fellow inmates as they’re dying. Naomi Cross coaches patient Becky, an ovarian cancer survivor, through the Caesarean delivery of her son. Sister Stephen runs a nursing home filled with goats, sheep, llamas and chickens where the entire nursing staff comes together to sing to a dying resident. And Brian McMillion, an Army veteran and former medic, rehabilitates wounded soldiers returning from war.